The basic German flamethrower combat unit was the twelve-man flamethrower shock troop (Flammenwerferstosstrupp) consisting of two small-flamethrower squads (Kleiftrupps) and four hand-grenade throwers. In the shock troop, the two flamethrower squad leaders became shock-troop leaders. 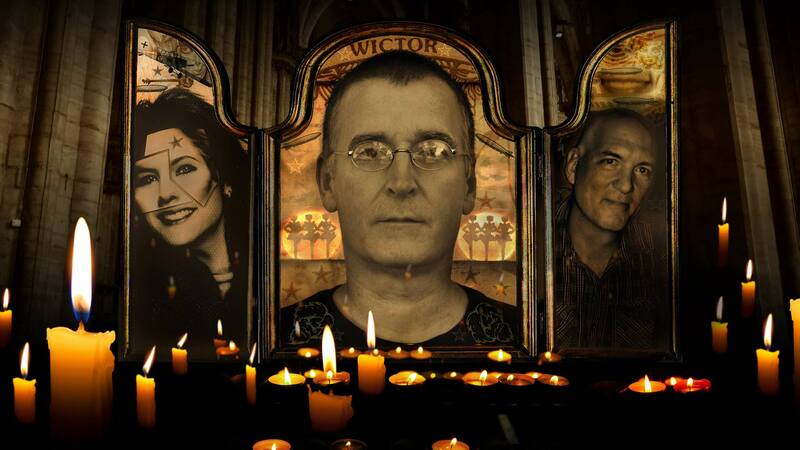 Click each image to enlarge. 1. 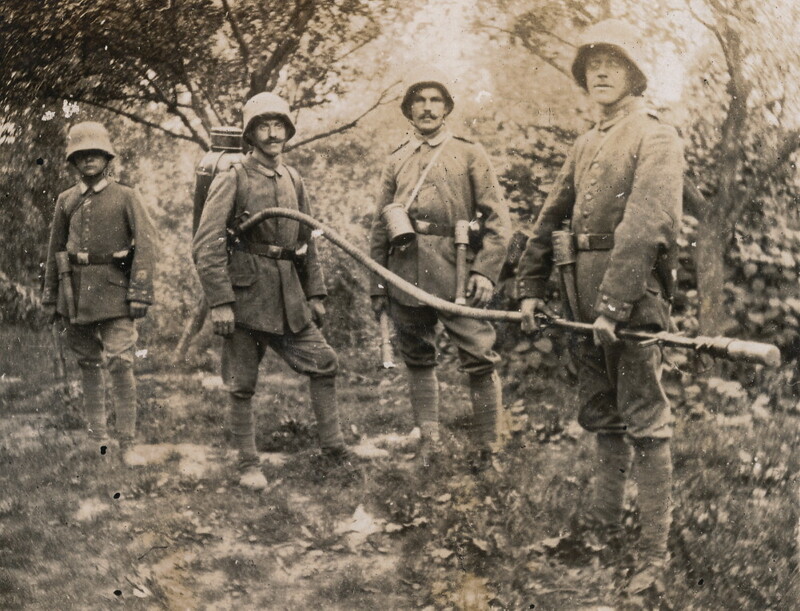 Four-man flamethrower squad consisting of lance operator, flamethrower carrier, assistant-grenadier (left), and squad leader. 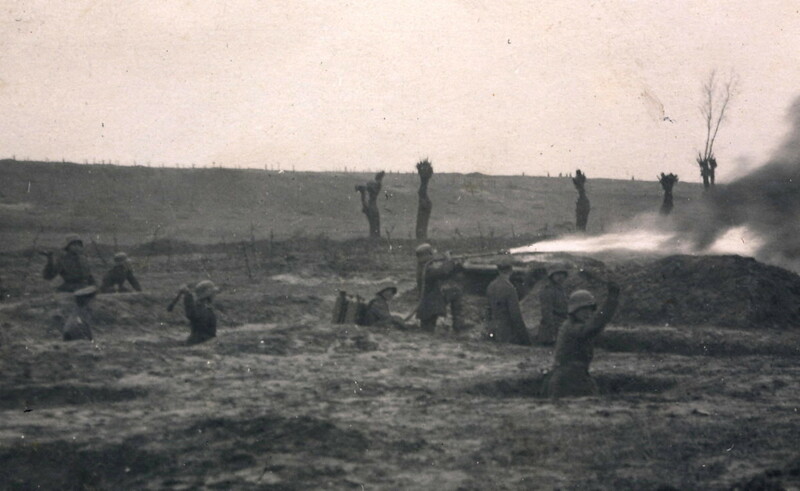 The flamethrower is the M.1917 kleine Flammenwerfer or Kleif. Each of the squad members is armed with a 9mm P08 pistol, and all except the flamethrower carrier also have two M1917 stick grenades. 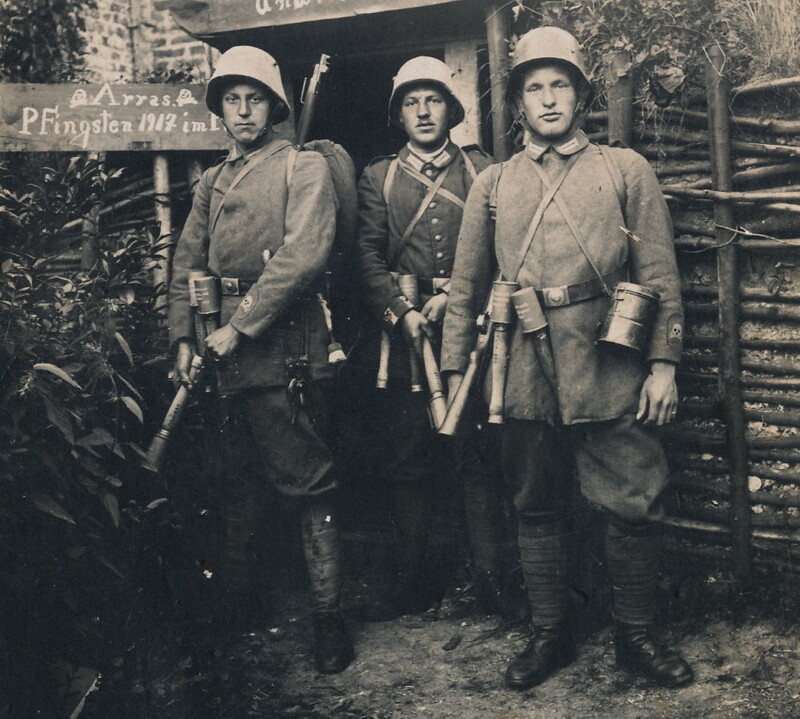 Steel helmets are fitted with cloth camouflage covers, and respirators are carried in M1916 metal containers. 2. Flame pioneers who will accompany the flamethrower squads as hand-grenade throwers. 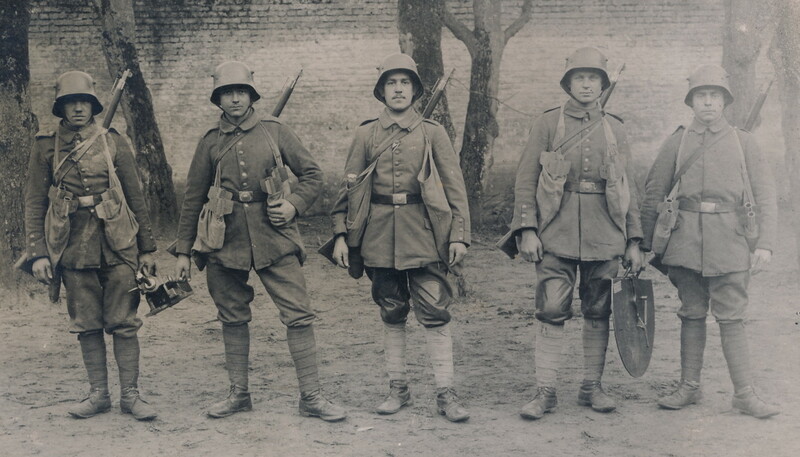 They are lightly equipped with Kar 98AZ carbines, stick grenades clipped to their belts, respirators, wire cutters, and rolled assault packs (Sturmgepäcke) consisting of greatcoat and blanket rolled around mess tin. 3. 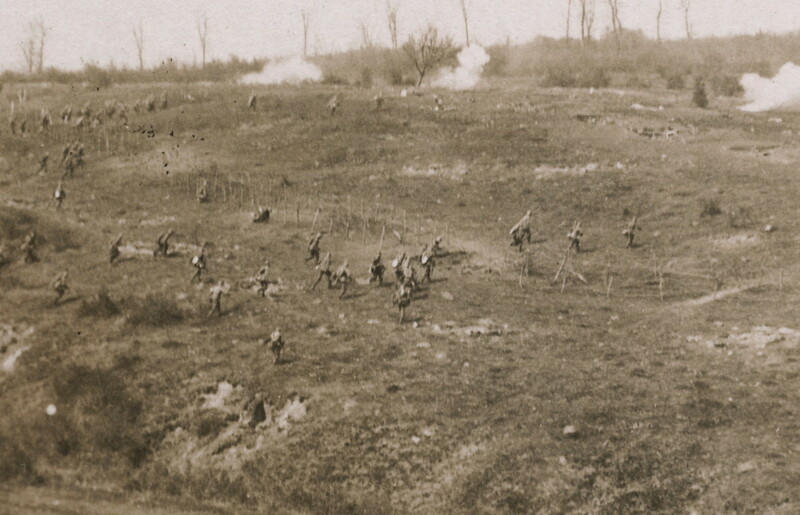 Twelve-man flamethrower shock troop in column formation for rolling up a trench. One flamethrower squad takes the lead, followed by one shock-troop leader, four hand-grenade throwers, the second flamethrower squad, and the second shock-troop leader. 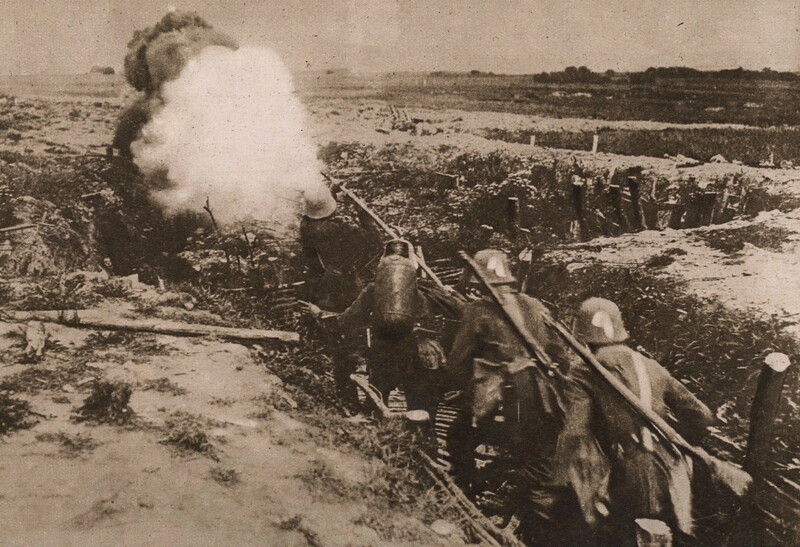 When rolling up a trench, the hand-grenade throwers will fling their missiles over the heads of the first flamethrower squad. Hand-grenade throwers would be armed with both stick and egg grenades. 4. Four-man machine-gun squad, which will cover the advance of the flamethrower shock troop. From left they are the squad leader, the machine gunner armed with a captured British .303 caliber Vickers Mk I gun stripped of its tripod to make it lighter and more maneuverable, an ammunition carrier, and a water carrier. All have P08 pistols as side arms and are equipped with two stick grenades each. 5. 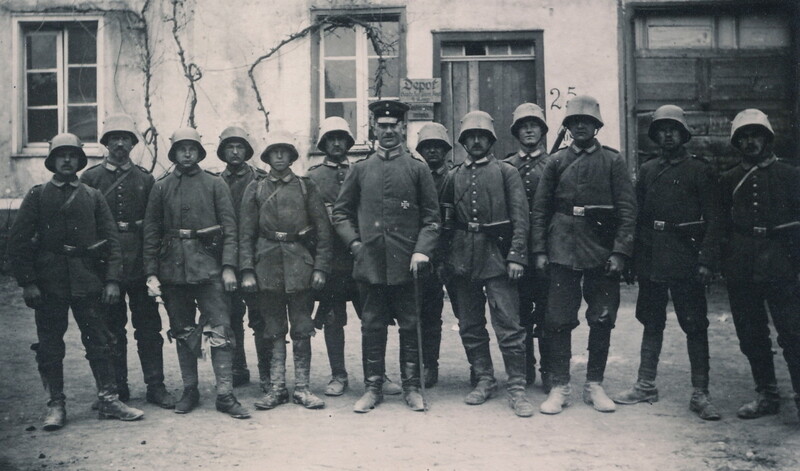 Grenade-launcher squad, armed with the Granatwerfer 16, also called the Priestwerfer. 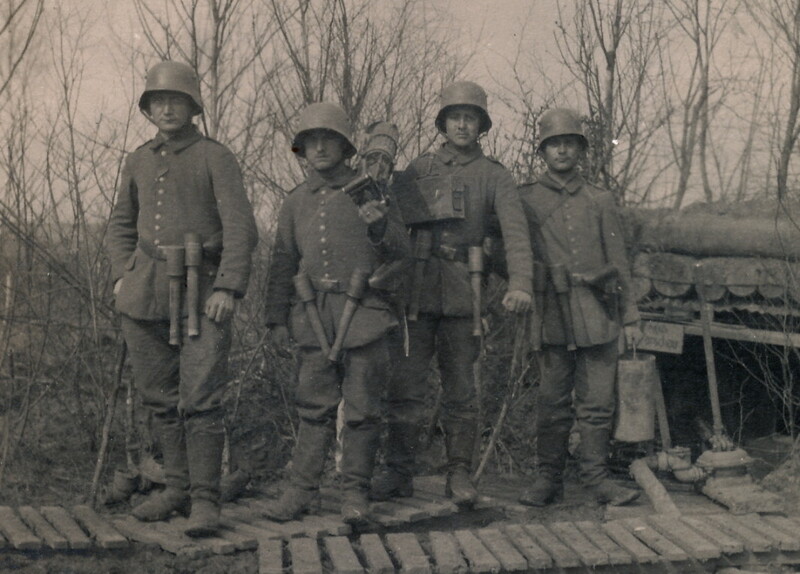 The men on the left carry the launcher itself, while the two on the right carry the steel base plate. Four are equipped with bags of Wurfgranaten—finned aerial grenades—while the squad leader in the center is armed with stick hand grenades to protect his men. 6. At zero hour the grenade-launcher squad—which has positioned itself either at the jumping-off point or in a shell hole or sap in No Man’s Land—begins a surprise, two-minute shower of grenades on the target position. 7. The flamethrower shock troops leave their trenches and rush through passageways cut in their own barbed wire. 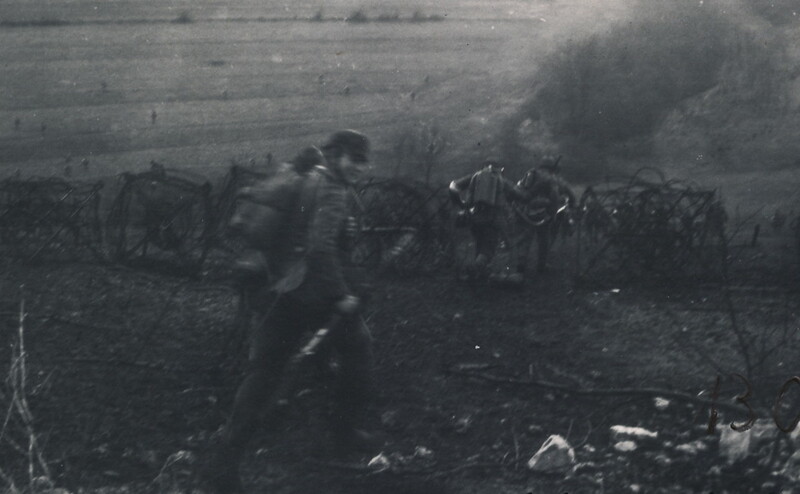 Infantry shock troops follow close behind. 8. The heavy or light machine guns—located in shell holes in No Man’s Land or saps dug out from the German line—fire past the flamethrower shock troops, forcing the enemy soldiers to keep their heads down. 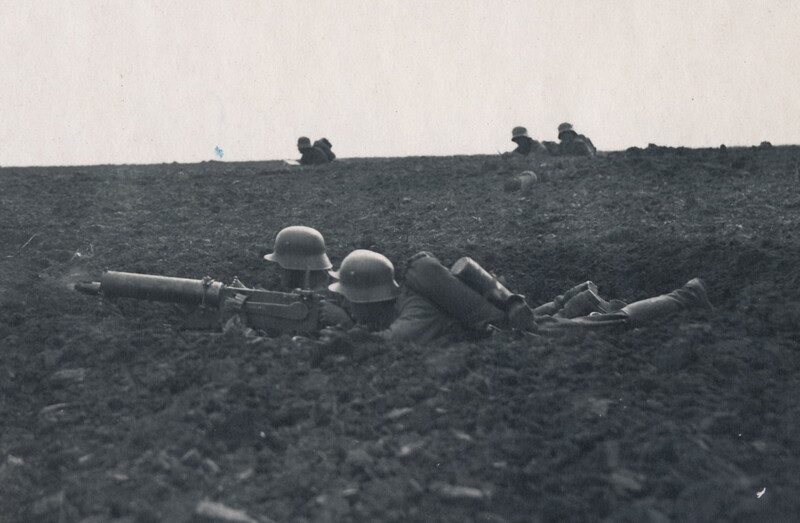 This weapon is the 7.92mm MG08 on an improvised trench mount. 9. As aerial grenades rain down on the enemy positions, the flamethrower shock troops and infantry cross No Man’s Land using “Indianlike forward stalking,” moving indirectly in small leaps and bounds while taking advantage of natural cover and staying within earshot of each other. In this photo one flamethrower squad takes the lead. 10. 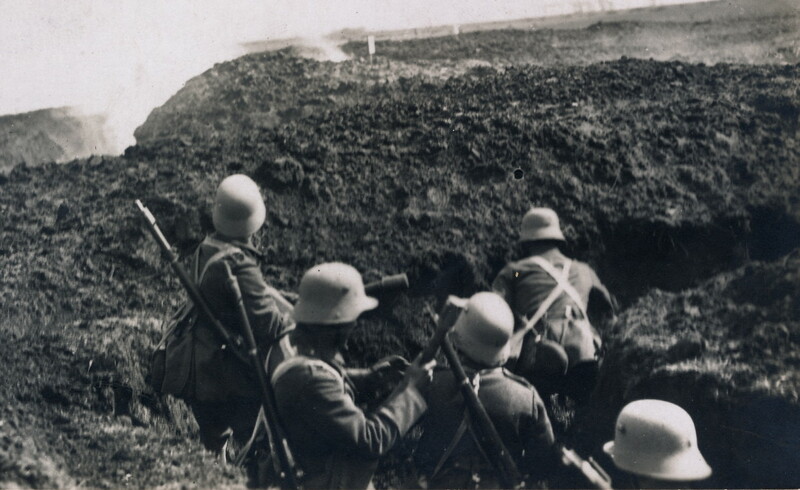 When the flamethrower shock troop arrives within thirty yards of the enemy trench, the lead flamethrower squad stops and fires a “covering jet” (Deckungsstrahl), which again forces the enemy to duck down. This is the final step of the shock troops’ dash across No Man’s Land. Next, they will enter the enemy trench. 11. Under the thick, black smoke of the covering jet, the flamethrower shock troop enters the enemy trench. Bent double, the grenadiers follow the lead flamethrower squad, while the second flamethrower squad brings up the rear. 12. In the winding trench, the flamethrower shock troop retains its columnar formation. The lead flamethrower squad fires its weapon through the traverse on the upper right, while hand-grenade throwers and one shock-troop leader (in the light-colored helmet) wait in a traverse in the center of the photo. At the end of the column on the lower right is the second flamethrower squad, ready to take the place of the first when it runs out of oil. The lead flamethrower squad will then continue fighting with pistols, grenades, bayonets, and sharpened spades. 13. 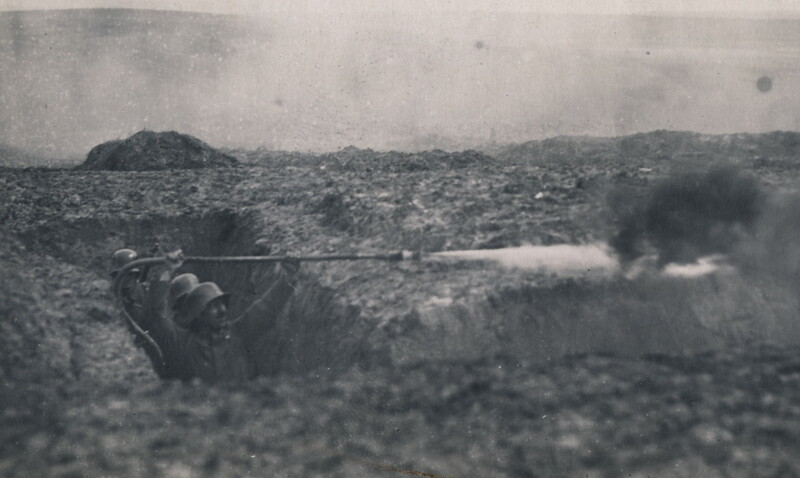 At the head of the column, the lead lance operator fires burning oil across the top of the trench and down the full length of the traverse. The long flamethrower hose allows the lance operator to shield himself from enemy return fire. 14. The hand-grenade throwers play a crucial role. They throw volleys of missiles into traverses and use their carbines and rifles with deadly accuracy, all being trained marksmen. 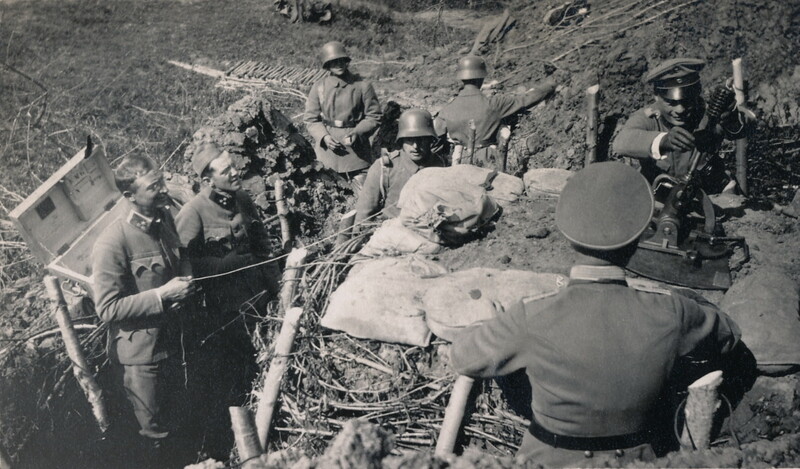 When necessary they use shovels to convert the enemy trench to a German trench by reversing the parapet and parados. They clear entire sections of trench, barricading the end with sandbags to prevent the enemy from counterattacking. 15. 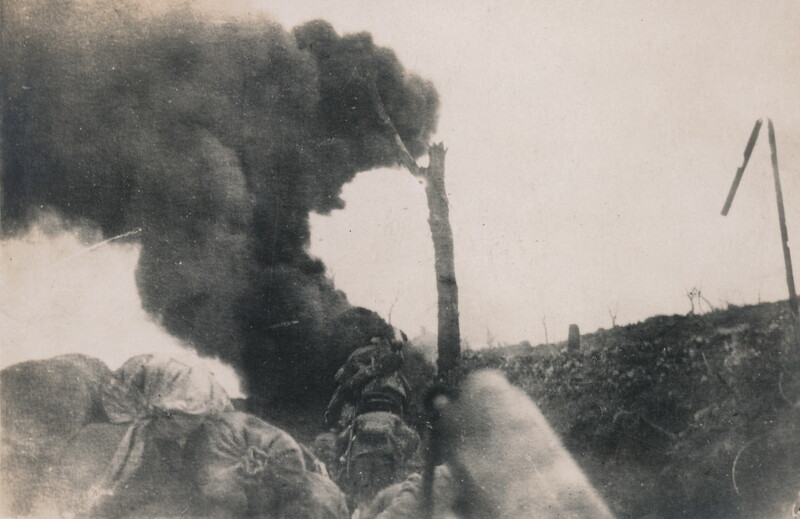 At an especially dramatic kink in the trench line, the lead lance operator arcs the jet of burning oil over the open ground between traverses to reach enemy troops crouched at the bottom. The jet could also be fired around corners by bouncing it off the trench wall. Two hand-grenade throwers prepare to overtake the flamethrower squad. To keep track of individual echelons during the wild confusion of trench raids, attacking troops often identified themselves with numbers painted on the rear of the helmet cover. 16. 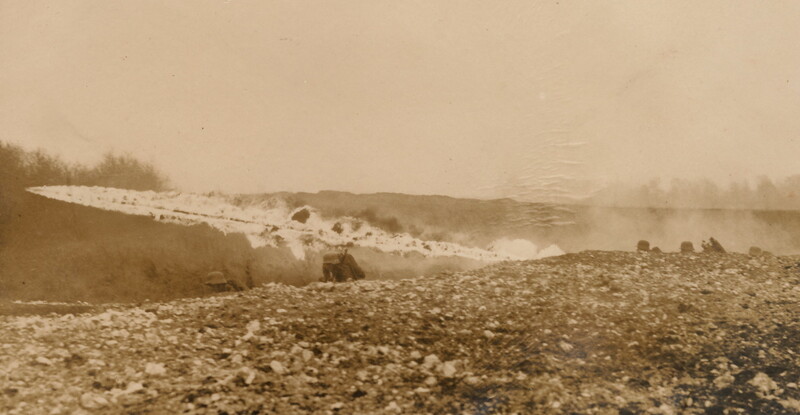 Final destination, a strong point at the end of the trench, which is assaulted with flamethrowers and hand grenades until the occupants have surrendered or are dead. 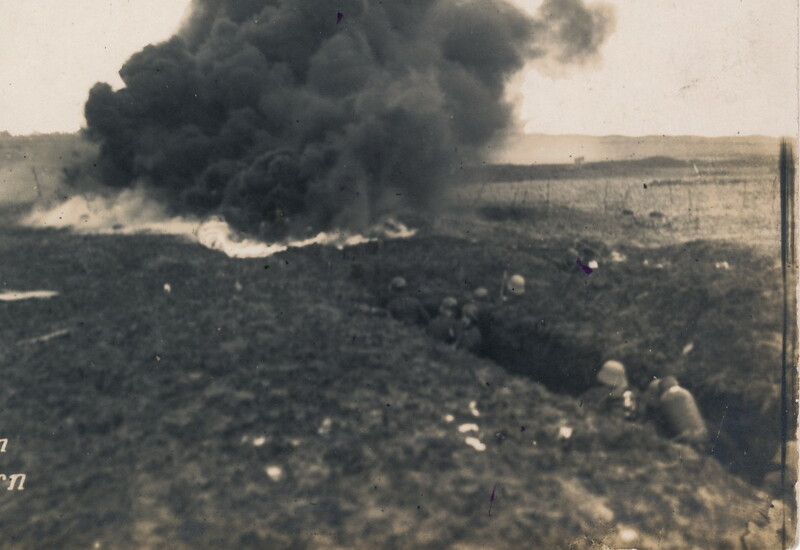 Rolling up trenches with flamethrowers was much less costly to the Germans than using hand grenades alone, the method preferred by the Allies. 17. 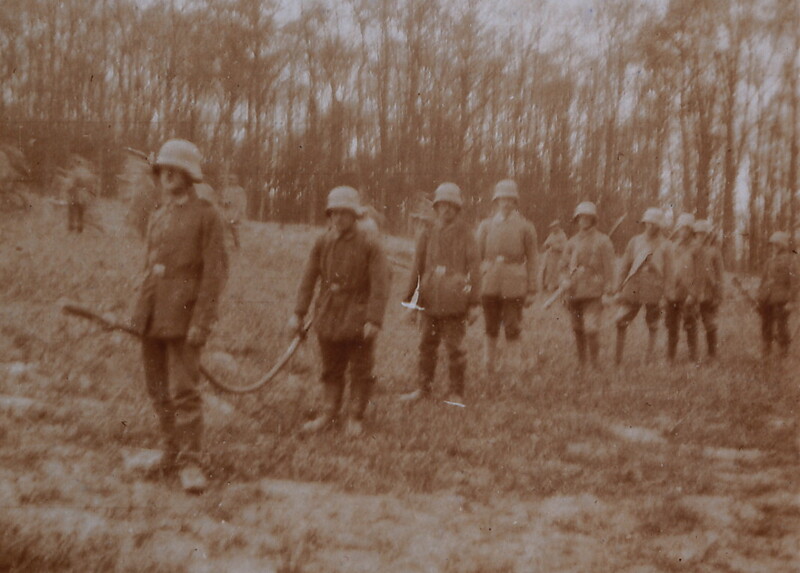 Flamethrower shock troop back from a trench raid. Their company commander—a captain—stands in the center. Note the P08 pistols, respirators, rolled assault packs, and the single Kar 98AZ carbine. Signs of combat include torn trouser knees, a bandaged hand, and the severely swollen face of the pioneer fourth from the left. Some of the men wear cloth camouflage covers on their helmets; others have painted their helmets with geometric designs.